Tommi over at S60's Applications blog informs us of a new "Social Phonebook" thats currently in Beta. 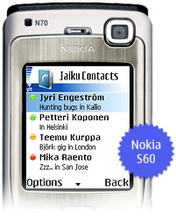 Jaiku is a social phonebook that displays real time presence and location of your contacts. Seems interesting enough. Once installed Jaiku connects to its server in order to display your presence. Nokia 6260, 6600, 6620, 6630, 6670, 6680, 6681, 6682, 7610 and N70. I was brave enough to install it and get it working on the Nokia N90.